Perhaps best known for being (quite literally) dc Talk's side-kicks, rap/hip hop outfit GRITS (Grammatical Revolution In The Spirit) have finally established themselves as artists in their own right. Liz Liew spoke to them at the Greenbelt Festival. Stacey Jones and Teron Carter (aka GRITS) have a certain understanding. Ask them a question and they'll invariably take it in turns to say "somethin' funny", each one providing the other with ammunition for the next barrage of jokes. Listen to their music and the same rapport is apparent. So how did this collaboration come about? Stacey and Teron met six years ago whilst touring as hired dancers with DC Talk. I asked them the inevitable - how they got to dance with the CCM bigtimers. Replied Stacey, "Well, I basically broke into one of their homes with a gun and shouted, 'I wanna dance with you! Let me! Let me!'" Teron added, "And I just, like, went with him." Stacey continued, "How did it come about? Well, Teron was there first and I joined later. Basically I got the part through auditions. We first met when we did the 'Walls' video and after that I was invited to come along on the road and be a dancer." Teron: "I met DC Talk two years prior to actually dancing with them. My band opened up for them in a few shows at my church in Jacksonville, Florida and from that we became friends. When the time came for them to audition dancers, I was invited." Indeed we may remember Teron particularly for his appearance in DC Talk's video 'I Love Rap Music' both as a dancer - and also as a granny! Teron laughed. "There aren't many videos we're not in. I don't think there are any except 'Heavenbound' which I am proud not to be in! God delivered us from 'Heavenbound'!" Through touring with the band Teron and Stacey became close friends. Stacey explained, "We both like doin' the same things. We hung out so much that we started gettin' into the same music. So when Teron was into hip hop, I'd start listenin' to hip hop." After a few years on the road they recognised their creative potential and began writing songs together. Stacey resumed, "We kinda both wrote but we didn't know this deal with Gotee would come about - God basically shaped all of this." No doubt inspired by the rap element of DCT's older style (remember their 'Rock, Rap And Soul' video? 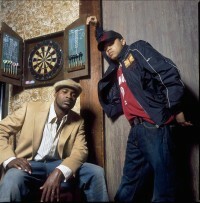 ), the duo cite "hip hop in general" as most influential. Said Stacey, "I don't like one artist particularly -1 just love the music and the beat. If I'm at home eatin' dinner or something, I play hip hop and dance and almost choke tryin' to rap and eat at the same time!" Teron added, "The only other influence that I've had is jazz and if I could choose only one artist it'd be Miles Davis. He has been a great influence on my life through reading his autobiography and following his music a little bit. I like his style!" GRITS' debut album 'Mental Releases' strongly reflects these two influences which they would prefer to call a "fusion of styles". Dealing with issues including child abuse and molestation ("Victims"), human suffering ("Get The Picture") and backslidden Christians ("Set Your Mind At Ease"), GRITS aim to "encourage and uplift but also to educate people" through their music. Racism is another subject they feel strongly about. "We need to realise that racism still exists. We're not here to be pro-black or pro-this or pro-that," Stacey explained. Teron interjected, "But pro-love." "Exactly," confirmed Stacey. "We need to recognise that it happened and that it's time to reach out to one another. Also, that it's time for us, as black people, to be forgiving because God holds our destiny, not white man or whoever they might like to think. But at the same time, for white people not to act like nothing happened." Teron added, "I don't think there's anything racist about caring and embracing your culture - to me, that's very Godly. God created a race of people in the first place that he called his children which were the Jews and Israelites. So race is something (just like everything else) that Satan has taken and corrupted." 'Mental Releases' has been well received in the States and the band are even beginning to grow a fan base in the UK. So what kind of crowd do they attract at their concerts? Teron replied, "Really it's broad." Stacey joked, "Murderers, convicts, prison wardens, dope dealers... all kinds of people!". He elaborated, "We play anywhere from our local churches to secular hip hop clubs, coffee shops, etc. We do 'em all - basically wherever anybody'll have us! We believe in the message of Christ - of goin' in the world and preachin' the gospel to all, no matter where they are. Just because we play in a club doesn't mean we're not Christians. To me we're carrying out what Christ told us to do in the first place - takin' the Word to the lost. Besides, if we don't go to them, they definitely won't come to us!" So do they always share their beliefs with their audiences or do they let their music "speak" for itself? Stacey replied, "We do both actually. We let people know where we're comin' from. We don't preach to people - we just tell them about ourselves and give our testimonies. We don't say, 'You're goin' to Hell,' or stuff like that. That's not how we work." Teron confirmed, "Exactly. We have a different approach. I mean, a lot of it is done through the music because people have come up to us and said, 'Oh man, that one song you played...' or 'When you were explaining the meaning of that song, it really meant something to me.' It just depends on what the Holy Spirit wants us to do." The boys are currently working on their new album which is due for release in March 1997.1 asked them if they could tell us about it. "It's probably gonna have some new songs on it," replied Teron. Quipped Stacey, "It's definitely gonna be something that's not been done before - so don't be alarmed now!" Added Teron, "I dunno, 'God is doin' a nu thang' I guess!" So what exactly is the 'Grammatical Revolution'? Teron replied, "Basically you said it earlier - it's our lyrics. We're not rappin' to make a lot of money." ("'Cos if we were, we wouldn't be sittin' here doin' this interview!" Stacey interjected.) "We're just out to help people think about different things. Our aim is to challenge people," Teron continued. "Conversation is one of the most important things in life. First of all our conversation with God, ie, prayer. Secondly, our conversation with each other, ie, building each other up by encouragement. That is the 'Grammatical Revolution'. We want to cause a movement in people's lives in the Spirit through what we say and to be guided by the Spirit to say what he wants us to say. We have to be directed in the Spirit grammatically to cause a revolution which we hope to do through our music, through conversations and through interviews. That's our goal."